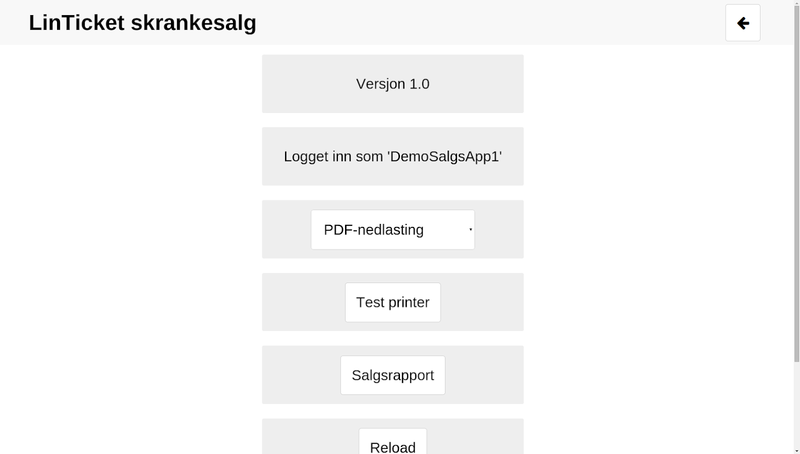 Med LinTickets salgsapp selger du enkelt billetter over skrankeparallelt med salg på nett.Appen støtter utskrift tilkvitteringskriver (både USB og på nettverk) og PDF-utskrift tilvanlig forhåndsinstallert skriver.Benytter du deg av LinTicketshovedsystem med booking, ressurshåndtering, billettsalg m.m. kan duselvsagt benytte deg av denne appen også.Registrer deg som arrangørpå www.linticket.no !With LinTickets salgsapp sell you singletickets over the counter in parallel with the sales network.Appsupports printing to receipt printer (both USB and network) and PDFprinting to plain pre-installed printer.Do you use LinTickets mainsystem with booking, resource management, ticket sales, etc. Youcan of course use this app too.Register as an organizer onwww.linticket.no! 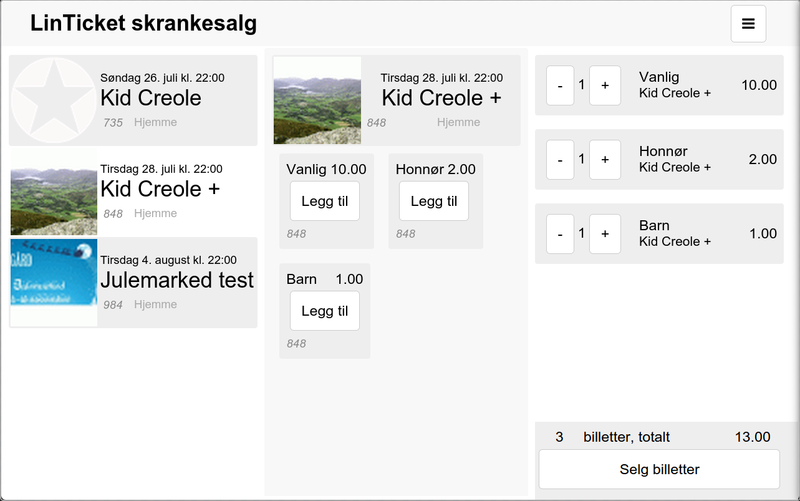 LinTicket spill-app brukes i forbindelse med LinTickets spill-modulder du kan lage interaktive spill med oppgaver, quizer ogfotooppdrag.LinTicket game app is used in conjunction withLinTickets game module where you can create interactive games withpuzzles, quizzes and photo assignments. Med LinTickets app kan du holde deg oppdatert og kjøpe billetterdirekte med kort, på faktura, med SMS eller med mCash. Billetterkan lagres offline og vises direkte i døra for skanning. Se hva somskjer i nærheten på kart. With LinTickets app you can keep up todate and buy tickets directly with the card, on invoice, SMS ormCash. 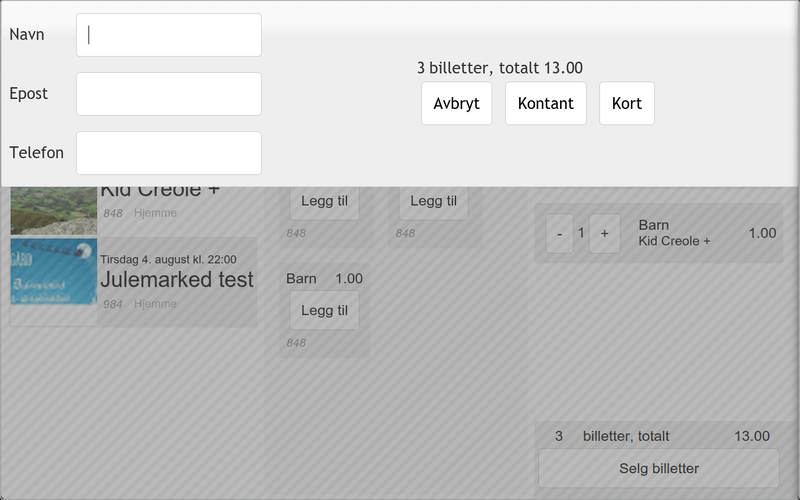 Tickets can be stored offline and displayed directly in thedoor for scanning. See what's happening near the map. 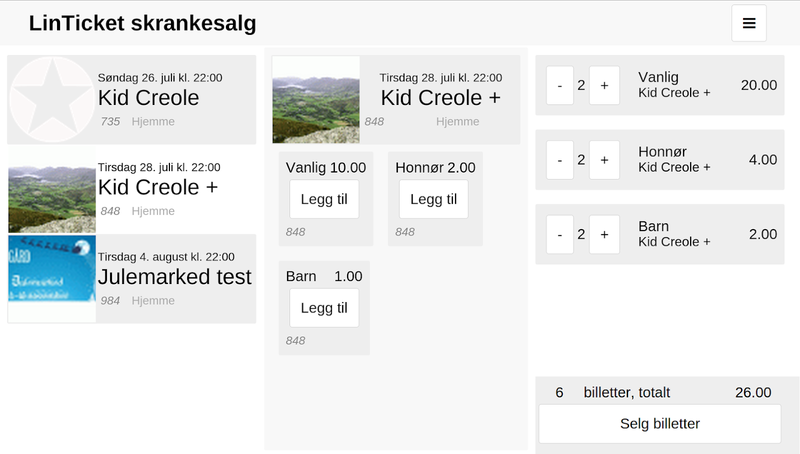 Skanner-app for skanning av QR- og strekkoder til billetter ogakkrediteringskort i LinTickets booking- og billettsystem. Brukkameraet, tilkoblet skanner eller søkefunksjon foradgangskontroll.Scanner app to scan the QR and barcodes for ticketsand accreditation cards in LinTickets booking and ticketing. Usethe camera, connected scanner or search function for accesscontrol. Print, scan, and share directly from your Android phone or tablet.Print photos, emails, webpages and files including Microsoft® Word,Excel®, PowerPoint® and PDF documents. Also supports Box, Dropbox,Evernote®*1, Google Drive™ and Microsoft OneDrive™. Epson iPrintmakes printing easy and convenient whether your printer is in thenext room or across the world. Key Features • Print, scan, andshare directly from your Android phone or tablet • Print fromanywhere in the world to email-enabled Epson printers using remoteprint functionality • Print photos, PDFs and Microsoft Office Word,Excel and PowerPoint files (Microsoft Office files require accessto Google Drive for rendering into printable PDF) • Print storedfiles, email attachments, and online files from Box, Dropbox,Evernote, Google Drive and Microsoft OneDrive • Capture a documentwith your device camera, format, enhance, then save, ready to print• Scan from your Epson all-in-one and share your file (save to yourdevice, send via email or save online) • Copy documents and photosusing your mobile device and a nearby Epson printer • Transferfiles between your device and an SD card or USB drive via an Epsonprinter • Check your printer’s status and ink levels • Print withina complex network environment using manual IP printer setup • Gethelp with a built-in FAQ section *Supports Android version 4.4 orhigher Advanced Features • Print high quality photos with automaticbacklight and color cast correction • Choose and print multiplephotos • Print your email attachments and stored files • Configureyour print options including paper size and type, number of copies,page range and one- or two-sided printing • Print with and withoutborders • Switch between color or monochrome printing • Choose fromdifferent scanning resolutions and image types • Optimize printquality • Buy ink and supplies for your printer • Setup &register to Epson Connect • Manage remote printers PrintersSupported See the following website for supported printers.http://support.epson.net/appinfo/iprint/en * To use iPrint with aWi-Fi Direct connection, you must allow the app to use yourdevice's location services. This allows iPrint to search forwireless networks; your location data is not collected. *1 Evernoteis a registered trademark of U.S. Evernote Corporation. TheBluetooth® word mark and logos are registered trademarks owned bythe Bluetooth SIG, Inc. and any use of such marks by Seiko EpsonCorporation is under license. We welcome your feedback.Unfortunately, we cannot reply to your e-mail. Brother iPrint&Scan is a free app that lets you print from andscan to your Android device. Use your local wireless network toconnect your Android device to your Brother printer or all-in-one.Some new advanced functions have been added (edit, fax send, faxpreview, copy preview, machine status). For a list of supportedmodels, please visit your local Brother website. [Key Features] -Easy to use menu. - Simple steps to print your favorite photos, webpages, emails (Gmail only) and documents (PDF, Word, Excel®,PowerPoint®, Text). - Print your documents and photos directly fromthe following cloud services: DropboxTM, OneDrive, Evernote®. -Scan directly to your Android device. - Save scanned images to yourAndroid device or email them (PDF, JPEG). - Automatically searchfor supported devices on a local wireless network. - No computerand no driver required. - The NFC function is supported, thisenables you to print or scan by simply holding your mobile deviceover an NFC mark on your machine and tapping the screen. - Theremote print function enables you to print from anywhere. (Yourmachine needs to support Google Cloud Print to use this function. )*Memory card needed for printing and scanning. *To use the NFCfunction, both your mobile device and your machine need to supportNFC. There are some mobile devices with NFC that cannot work withthis function. Please visit our support website(http://solutions.brother.com/) for a list of supported mobiledevices. *As the remote print function is based on Google CloudPrintTM, you must first register your machine in your Googleaccount. For detailed information, please see the Google CloudPrint Guide available on the Brother support website(http://solutions.brother.com/). "[Advanced Functions] (Onlyavailable on new models.)" - Edit previewed images using theediting tools (scale, straighten, crop) if necessary. - Send a faxdirectly from your mobile device. (This app feature requires accessto the contacts list on your mobile device.) - View received faxesstored on your machine on your mobile device. - The copy previewfunction enables you to preview an image and edit it if necessarybefore copying to avoid copy errors. - View the machine’s statussuch as ink/toner volume and error messages on your mobile device. *Compatible functions will depend on the selected device. [Compatible Print Settings] - Paper Size - 4" x 6" (10 x 15cm)Photo L (3.5" x 5" / 9 x 13 cm) Photo 2L (5" x 7" / 13 x 18 cm) A4Letter Legal A3 Ledger - Media Type - Glossy Paper Plain Paper -Copies - Up to 100 [Compatible Scan Settings] - Document Size - A4Letter 4" x 6" (10 x 15cm) Photo L (3.5" x 5" / 9 x 13 cm) Card(2.4" x 3.5" / 60 x 90 mm) Legal A3 Ledger - Scan Type - ColorColor (Fast) Black & White *Compatible settings will depend onthe selected device and function. *Google Cloud Print is atrademark of Google Inc. Use of this trademark is subject to GooglePermissions. *Evernote is a trademark of Evernote Corporation andused under a license. *Microsoft, Excel, and PowerPoint are eitherregistered trademarks or trademarks of Microsoft Corporation in theUnited States and/or other countries. *Please note the emailaddress [email protected] is for feedback only.Unfortunately we cannot reply to inquiries sent to this address. Print directly from Android phone or tablet to almost any printer!Print photos, emails, documents (including PDF, Microsoft® Word,Excel®, PowerPoint® and other files), bills, invoices, messages,web pages and more. PrinterShare makes printing easy and convenientwhether your printer is right next to you or across the world!IMPORTANT: Some of the features are NOT FREE! To unlock thesefeatures, you would need to purchase and install the PrinterSharePremium Key app, a stand-alone tiny application that simply needsto be installed on the device to unlock the Premium Features of thefree app. We highly recommend printing the test page to ensurecompatibility with your printer prior to purchasing the PremiumKey. NOTE: Unfortunately, we had to remove the SMS and Call logprinting features from our app due to the update to the Permissionspolicy on Google Play. Dear customers, we are as much upset by thisissue as you are. And we are doing our best to resolve the issue.For this reason please stay tuned to the app updates. Once weobtain the necessary Messages and Call log permissions from Google,we are planning to bring the features back to the app. WithPrinterShare you can easily print images and photos (JPG, PNG,GIF), emails (from Gmail) and attachments (PDF, DOC, XLS, PPT,TXT), contacts, agenda, web pages (HTML) and other digital contentfrom device memory, cloud storage providers such as Google Drive,One Drive, Box, Dropbox and other applications using Share action.You even can print text messages for trial or legal matters! PrintUPS shipping labels directly from a browser on Android device tosupported thermal printers by logging to UPS website. Also, you canconfigure many printing options such as paper size, pageorientation, copies, page range, one- or two-sided printing (duplexmode), print quality (resolution), color or monochrome, media trayand more. With the free version of the app, you can: * Print withcertain restrictions on nearby wireless (WiFi, Bluetooth) anddirect USB OTG connected printers; * Print on Windows shared(SMB/CIFS) or Mac shared printers; * Print via Google Cloud Print(including Save as PDF); * Print 20 pages in the remote mode overthe Internet. For unlimited printing, you would need to have thePrinterShare Premium Key app installed on your mobile device.Premium Features include: * Unlimited Nearby direct printing (PDFs,documents, photos and more) via Wi-Fi or Bluetooth without acomputer; * Unlimited Remote printing. The receiving end (Windowsor Mac) would not have to buy pages or subscribe. PrinterSharesupports a wide variety of HP, Canon, Brother, Kodak, Samsung,Dell, Ricoh, Lexmark, Kyocera, OKI and other printers includinglegacy networkable. A full list of supported printers available athttp://printershare.com/help-mobile-supported.sdf. You can alsoprint to unsupported and legacy printers with our free computersoftware for Mac and Windows available at http://printershare.com.Here is the list of printers supported by PrinterShare app:http://www.printershare.com/help-mobile-supported.sdf Make surethat your printer is supported. Please note: 1) Requestedpermissions are needed to print content and are not used to collectyour personal data. For a more detailed explanation please see ourFAQ at http://www.printershare.com/help-mobile-faq.sdf 2) GoogleCloud Print requires the latest version of Chrome browser on yourcomputer or Google Cloud Print capable printer. For more setupinstructions please read http://www.google.com/support/cloudprint/3) If something isn't working as expected, please send us an emailto [email protected] Have a good print! P.S. For directnearby printing to selected printer models PrinterShare downloadsand uses drivers provided by HPLIP (http://hplipopensource.com) andGutenPrint (http://gimp-print.sourceforge.net). These drivers aredistributed under GNU General Public License, version 2. Canon Print Service is software that can print simply from themenus of applications that support Android's printing subsystem. Itcan print from smart phones and tablets using Canon printersconnected to wireless networks. Main features: - Switching betweencolor and black-and-white printing - 2-sided printing - 2 on 1printing - Borderless printing - Stapling pages - Setting papertypes - Secure printing - Department ID management - PDF directprinting - Printer discovery by specifying IP address - Recall fromthe share menu * Items that can be set vary depending on theprinter you are using. If you are using a mobile terminal withAndroid 6 or earlier installed: You need to activate the CanonPrint Service for printing using it. The Canon Print Service is notactivated immediately after installation. Activate it using one ofthe following methods. - Tap the icon displayed in the notificationarea immediately after installation, and activate the service inthe displayed settings screen. - Tap [Settings] > [Printing]> [Canon Print Service], and activate the service in thedisplayed settings screen. * If you are using a mobile terminalwith Android 7 or later installed, the service is automaticallyactivated after installation. Compatible printers: - Canon InkjetPrinters PIXMA TS series, TR series, MG series, MX series, Gseries, E series, PRO series, MP series, iP series, iX seriesMAXIFY MB series, iB series, Business Inkjet series imagePROGRAFPRO series, TX series, TM series *Except for some models * Whenusing this application, the largest output size of the PRO-1000 isA3 extended. - imageRUNNER ADVANCE series - Color imageRUNNERseries - imageRUNNER series - Color imageCLASS series - imageCLASSseries - i-SENSYS series - imagePRESS series - LBP series - Sateraseries - Laser Shot series - Compact Photo Printers SELPHY CP900series, CP1200, CP1300 Compatible OSs/Terminals: - Terminals withAndroid 4.4.2 (KitKat) or later installed. HP ePrint for Android is solely a printing app and not intended asa setup, scan or copy solution for your HP printer. If you need tosetup your new HP printer or use the HP recommended copy, print,and scan app, you will need to install HP Smart (Printer Remote)https://play.google.com/store/apps/details?id=com.hp.printercontrol&hl=enNote:HP ePrint for Android will be retired soon and is no longer the HPrecommended solution. Please consider using the recommendedsolution HP Smart (Printer Remote) The HP ePrint App may allow youto print from your Android smartphone or tablet, however werecommend for best results you should consider using therecommended solution HP Smart (Printer Remote). Print directly from your phone or tablet via WiFi, Bluetooth or USBcable without a computer. Direct mobile scanning is available forselected multifunction printers. IMPORTANT: PrintHand app is NOTFREE. In order to print real pages, you’ll need to upgrade toPremium Mode by making in-app purchase. We do recommend printing afree test page prior to upgrading. NOTE: Unfortunately, we had toremove the SMS and Call log printing features from our app due tothe update to the Permissions policy on Google Play. Dearcustomers, we are as much upset by this issue as you are. And weare doing our best to resolve the issue. For this reason pleasestay tuned to the app updates. Once we obtain the necessaryMessages and Call log permissions from Google, we are planning tobring the features back to the app. Using PrintHand you can printthe following content: - Office documents, including MS Word,Excel, PowerPoint, PDF; - Text files and other popular file types;- Photos and images; - Web pages, emails and attachments; - GoogleDrive content; - Events from Calendar app; - Contacts; - Facebookalbums; - Files from Dropbox; - Files from Box; - Files fromOneDrive; - Files from Creative Cloud; - Files from SugarSync; -Notes from Evernote; - Content shared from other apps. Print to Macor Windows shared printers, Workgroup, Domain and Active Directory.Print directly via USB cable from Android 4.0 and above. Print toGoogle Cloud. Share the printer with our free software for Mac andPC from printhand.com, and print to any printer as long as you canprint from the computer. You can print via: - Wi-Fi (using a Wi-FiDirect printer or using a Wi-Fi router as a middle man); -Bluetooth; - USB if USB OTG is fully supported by your device andit has Android 4.0+ installed. Please note that some of the mobiledevices are unable to communicate with a printer properly even ifUSB Host mode is supported. This happens due to specific electricaldesign of the USB port. Sadly in such case the app is not likely towork properly. - PC or Mac (if your printer is shared usingPrintHand desktop client or standard tools of your computer's OS);- Google Cloud Print; Here is the list of printers supported byPrintHand app:http://printhand.com/list_of_supported_printers.php?platform=androidAslo here is the list of supported portable printers:http://printhand.com/list_of_supported_portable_printers.php?platform=androidPlease make sure that your printer is supported. Our Printer SetupWizard will detect your printers automatically and guide throughthe configuration process if needed. In a few clicks you’ll be ableto print. You can now scan documents directly from the selectedmultifunction printers to your device. This feature is available inbeta mode, please contact [email protected] for details. Listof supported devices available athttp://printhand.com/list_of_supported_scanners.php. You can try toprint test page in our free app, but for unlimited printing youhave to purchase premium app or make in-app purchase in free app.Have a good print! It’s really simple to print from android devices to any printersvia Wifi, Bluetooth, USB and shared networks. Use our print app toprint directly without installing drivers or starting PC. Save timeand efforts with StarPrint!¤ All print features are FREE with adsplacement inside app. You can always remove ads by purchasingpremium package: - Run StarPrint > My Purchase > Check Price-Follow instruction, make payment and enjoy unlimited printing!¤Check if your printer have been supported before purchasing fullapp version here: bit.ly/SupportPrinter¤ Help us improve betterprint app for your need by answering this survey:http://bit.ly/PrintingSurveyWith this mobile print app, you caneasily print out PDF books, Open Office documents, MS Office files,research papers, family pictures, postcards, favorite internetarticles, email, contact, recipes, map (new! ), and menu right fromandroid phones/tablets.★ IMPORTANT ★In this version, it is mucheasier to add frames and effects before printing photos fromsmartphones and tablets. In order to use the feature, please chooseto print photo, select photo and then press on the 'pencil icon' inthe bottom right. You will be prompted to download an extensionapp. Please download it to use this feature.★ What StarPrintsupports ★¤ Wireless mode: printing via Bluetooth, Wi-Fi¤ Othermode: printing via USB, network printer, shared printer (SMB, IPP,LPD/LPR), printer box, router based printer share (Fritz Box),JetDirect¤ Compatible with AirPrint printers¤ 4000+ printer modelslike HP, Canon, Epson, Brothers, Samsung, Kodak, Dell, Lexmark,etc. ★ Get help for your print app (preferred English) ★There aremany unexpected reasons that might lead to printing errors. Trythese steps:1. Self-help with StarPrint FAQ:http://android-print.com/supports/faqs2. Or send us support requestvia Ask Expert function in app. Open app > Menu > AskExpert3. If you want to get your printer supported within 24 hrs,let join our "Printing without Stopping" campaign at:http://goo.gl/qntG4r4. Please be informed that we stop support fromJuly 2017Find us on social media:- Facebook:http://www.facebook.com/StarPrint.Android- Twitter:http://twitter.com/ISBVietnam- LinkedIn:https://www.linkedin.com/profile/view?id=415959487- G+:http://plus.google.com/113624145023558808301For more information toprint from android, please visit our website:http://android-print.comThis mobile print app is similar to hpeprint and other print apps. Moreover, it can print to variousprinter brand names, and accept multi-print at one time! "Canon PRINT Inkjet/SELPHY is the print and scan app for PIXMA,MAXIFY and SELPHY from your Android smartphone & tablet*1/2. *1: Available for devices with an ARM processor only. *2: Functionsand services may not be available for all printers or in allcountries, regions, and environments. [Key features] - Photo Print*3 Photo trimming is available - Document Print *4 Print PDF files& Microsoft Office® documents - Web page Print *4 Easily printweb pages from “Share” - Scan Seamlessly scan & save documentsand photos as PDF or JPEG - Cloud Link to PIXMA Cloud Link servicePrint pictures and documents from select social media platforms andstorage sites, as well as crafts from CREATIVE PARK with PIXMACloud Link from just about anywhere - Copy You can adjust your copysettings from your smartphone or tablet Especially helpful onprinters that don't have an LCD screen - Smartphone Copy Take apicture of a document with your smart device and apply auto skewcorrection for a print - Printer Settings Allows you to check yourInk levels, ink model number, buy ink, and access an online manualfor your printer - Bluetooth setup *5 Allows you to easily printand scan without registering your printer, receive error messages,and skip password entry when copying by a remote user interface -NFC-touch print and scan *6 Touch your device to the NFC enabledprinter after selecting photos to print from the ""Photo Print""app Set a document to be scanned and touch your device displaying""Scan ""on this application to an NFC enabled printer *3: OnlyJPEG files supported. *4: Incorrect print results may occur if datadoes not display properly on the screen. *5: Function available forAndroid 5.1 and later. This function is not guaranteed to operateon all Android devices *6: The function available for smartphonesand tablets with NFC. [Supported printers] - Canon Inkjet PrintersPIXMA TS series, TR series, MG series, MX series, G series, Eseries, PRO series, MP series, iP series, iX series MAXIFY MBseries, iB series imagePROGRAF PRO / TM series *Except for somemodels - Compact Photo Printer SELPHY CP900 series, CP1200, CP1300[Supported OS] Android 4.4 and later [Supported medias] - Mediatypes Plain Paper, Photo Paper Plus Glossy II, Photo Paper ProPlatinum, Photo Paper Plus Semi-gloss, Photo Paper Photo Paper Pro,Photo Paper Pro II, Photo Paper Plus Glossy, Photo Paper ProLuster, Glossy Photo Paper, Matte Photo Paper, Ink Jet Hagaki,Hagaki, High Resolution Paper, Other Photo Paper、Greeting Card,Cardstock - Media sizes *7 Letter 8.5""x11"" 22x28cm, Legal8.5""x14"" 22x36cm, A4, A5, 4""x6"" 10x15cm, 5""x7"" 13x18cm,8""x10"" 20x25cm, A3, A3+ 13""x19"" 33x48cm, 10""x12"" 25x30cm, B5,B4, 14""x17"" 36x43cm, L 89x127mm, 2L 127x178mm ,Hagaki 100x148mm,Credit Card 2.13""x3.39"" 54x86mm, Card 2.17""x3.58"" 55x91mm,Wide 4""x7.1"" 101.6x180.6mm, Square 5""x5"" 13x13cm, Square3.5""x3.5"" 9x9cm, Square 4""x4"" 10x10cm, Square 12""x12""30x30cm, 7""x10"" 18x25cm, 11""x17"" 28x43cm *7: ForPRO-500/PRO-1000, the maximum output size is A3+ (13""x19"" 33x48cm ) while in use of this application."